Memory Ball is coming in a few short weeks and the question begins to rise: what to wear to the ball? While the ladies worry about their dress lengths and which heels to wear, I’ve put together a few outfit ideas for the guys. There are lots of ways for men to look sharp under the “semi-formal” dress code, so here is some inspiration to think about! With spring in the air, perhaps it’s time to go for colour? You don’t need to go full on crayon box, but rather choose one pop of color that stands out. 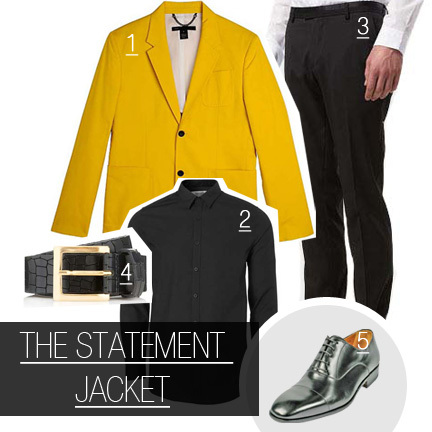 For example, this yellow blazer from Marc by Marc Jacobs (available at Holt Renfrew), paired with a black shirt, black skinny tux trousers and black leather croc belt from Topman. Finish off with this metallic shoe from Magnanni (available at Browns) and you’ve got yourself a statement, very on trend look.